After the recent boom in UTV sales, is Honda too late to the party? At its UK launch, Richard Bradley got a flavour of what customers can expect from the new range. 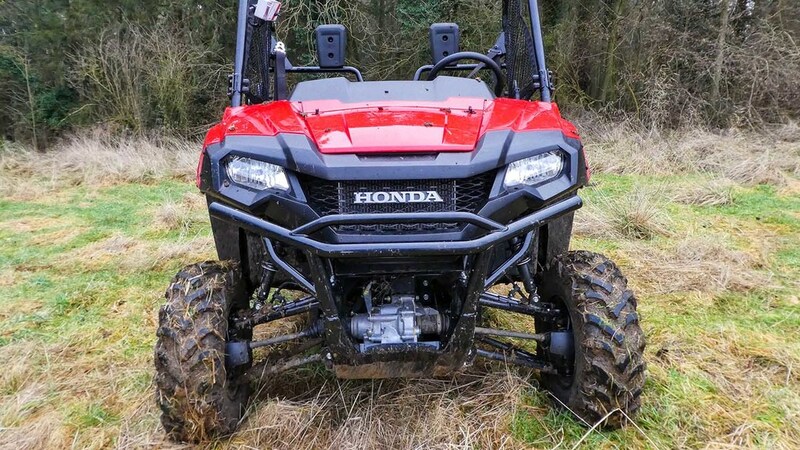 As utility vehicles (UTVs) continue to eat into the all-terrain vehicle (ATV) market, Honda sees the chance to finally bring its Pioneer to the UK market. 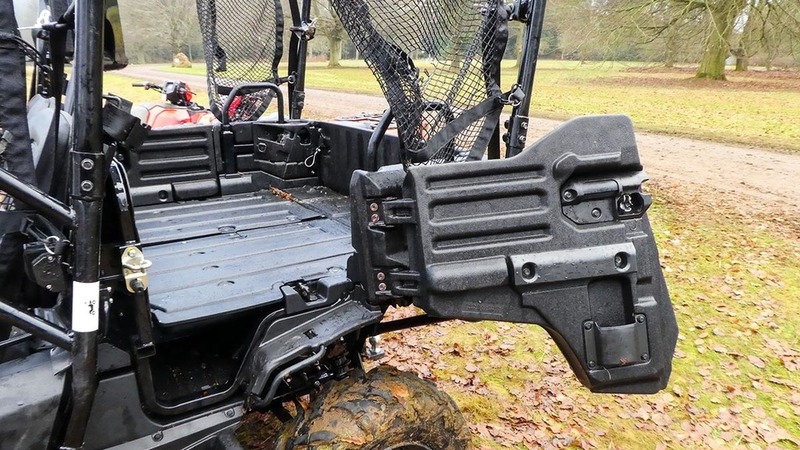 Honda is no stranger to producing an ATV, and neither is it to the UTV market, as in one way or another, the firm has been producing UTVs, for about nine years. 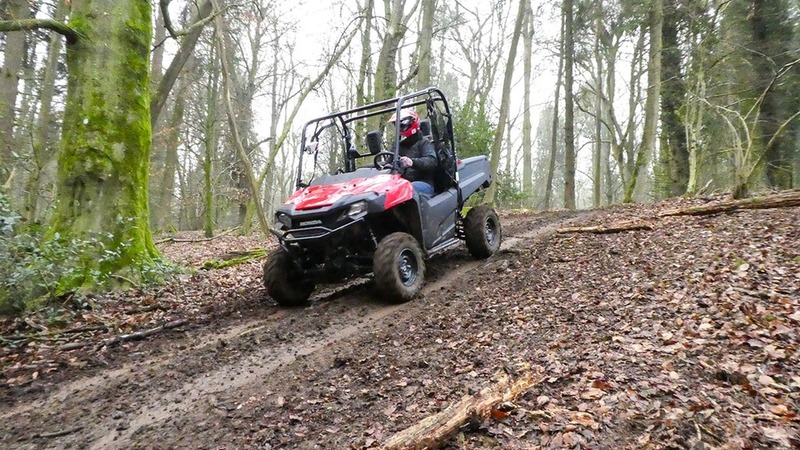 First seen in the UK in 2008, Honda’s Big Red UTV was only around for a short while before being dropped by the firm. After heading back to the drawing board, the firm launched its Pioneer in America in late 2013. First available with a 675cc engine, the Pioneer 700 offers two- or four-seater configurations; the range was later extended with 500cc and 1,000cc machines. 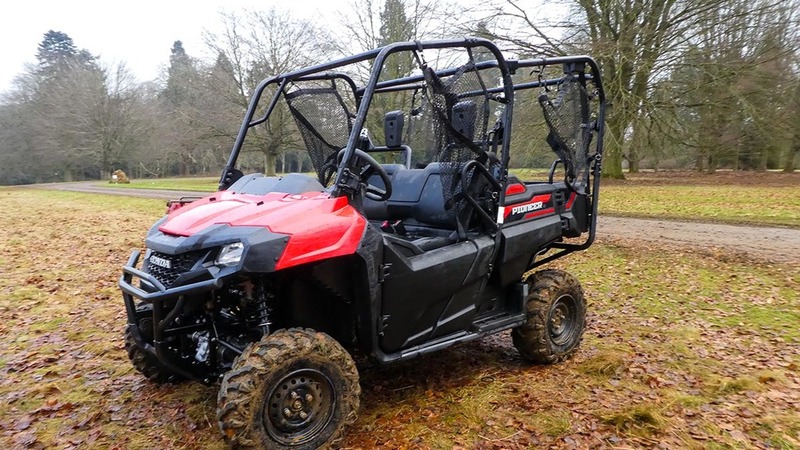 While it may seem they are being casual about bringing its UTV to the UK market, Honda says the initial Pioneer models (2013-2016) did not comply with EU road homologation regulations, which means they could not be sold. For 2017 the firm has revised the Pioneer 700, which now complies with the regulations and is CE marked. For the time being only Pioneer 700, two- and four-seater models are being brought into the UK. The firm says while it sees a market for the 500cc and 1,000cc models in the UK, neither currently meet EU homologation regulations. 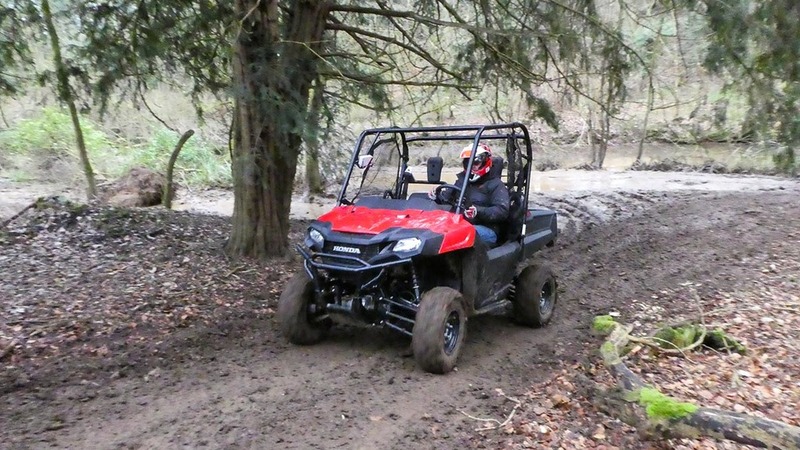 To get a flavour of the new Pioneer 700’s off-road capabilities, we introduced it to a demanding off road course on the edge of Cotswolds. 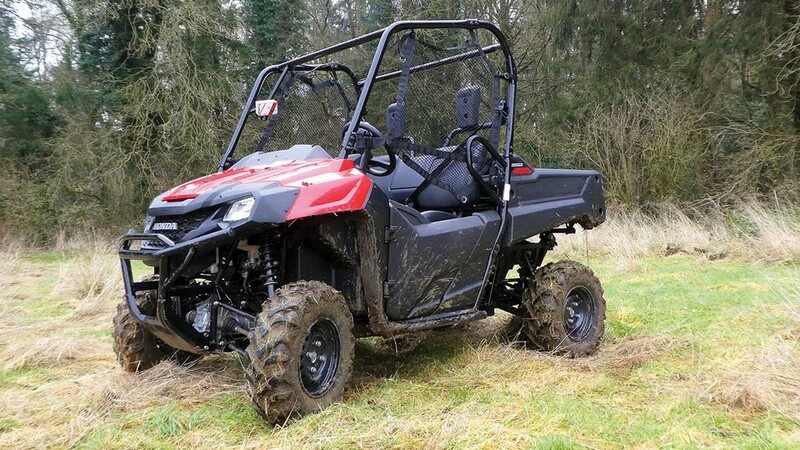 Taken from its top of the range TRX680 ATV, the Pioneer uses an in-house 675cc, single-cylinder petrol engine. While the engine’s 38hp may be about half the output of the Pioneer’s equivalent competition, Honda says it is what you do with it that counts. Via the use of an automatic, three-speed transmission, with torque convertor clutch, the firm claims the engine’s power is used more efficiently compared to a continuously variable transmission – as used by much of the Pioneer’s competition. The gear-lever is dash mounted, with simple forward-neutral-reverse positions. 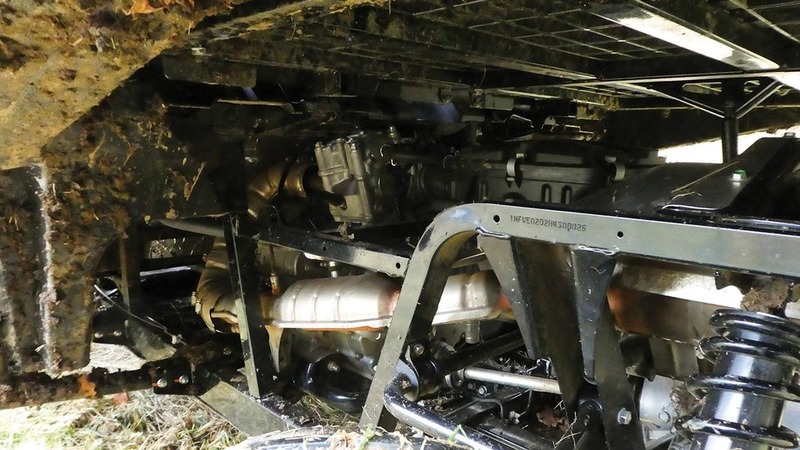 Engine position may improve weight distribution, but could make for awkward servicing. 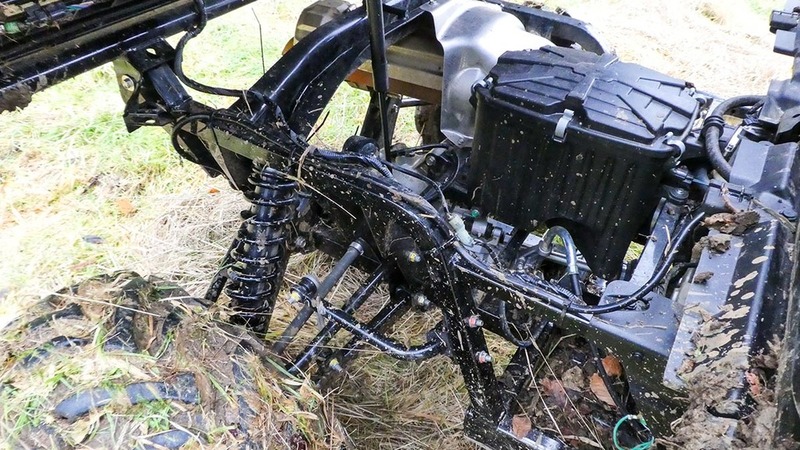 For better weight distribution, the engine is mounted in the middle of the UTV, underneath the seat. However, the location of the engine may pose an issue when it comes to engine oil changes, which have to be done every 1,000km or about every 100hours. The manufacturer claims the engine’s fuel use has been reduced by 20 per cent compared to the first Pioneer 700 model in the US, by fitting two spark plugs and an oxygen sensor inside the stainless-steel exhaust. Information from the sensor is relayed back to the ECU, which adjusts how rich or lean the fuel-air mixture going into the engine is, reducing excess fuel from being burnt. Throttle response to the automatic transmission is effective, with a pickup in speed from little very revs, and the firm reckons the Pioneer will exceed 65kph (40mph) top speed once the seatbelt is fastened; a sensor in the buckle limits speed to 24kph (15mph). Levers give a reassuring clunk when engaging the Pioneer's four-wheel drive and front diff lock. Two automatic gearbox response modes are used depending on how you use the throttle; shove your foot to the floor and the engine will bounce off its rev limiter before changing, gentle throttle movements will result in earlier changes, reducing fuel usage. Engaging four wheel drive is done via another, three-position, dash-mounted lever. For normal conditions drive is sent to the fixed rear differential. If things start to get a bit messy, four wheel drive can be engaged, with the further option to mechanically lock the front differential. While the use of a petrol engine could pose a practical problem for farmers, the firm says there are no plans to develop a diesel. Honda says for a diesel engine to offer comparable performance, it would be too large to fit in the Pioneer’s frame. 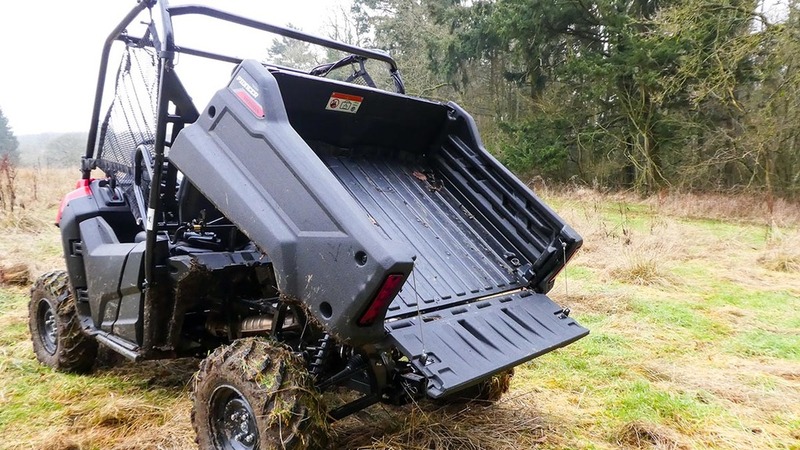 Honda says it designed the Pioneer’s chassis to be short and wide, allowing a higher bridging angle for off-roading. 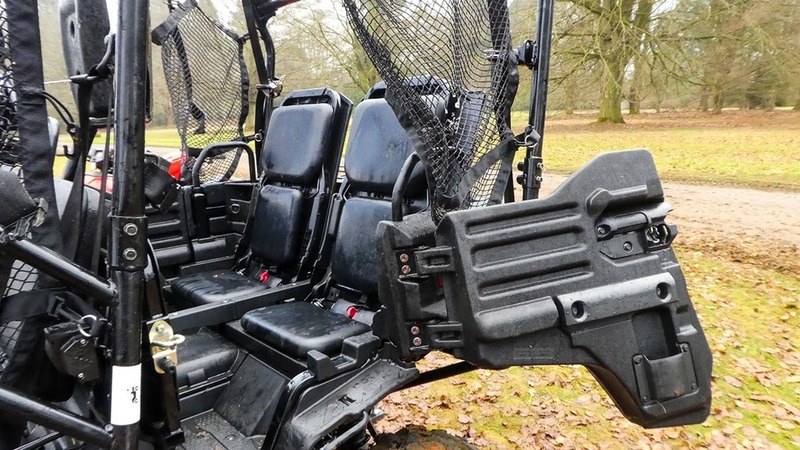 Both two and four seater models use the same chassis, as the rear seats are mounted in the load bed. Wide stance and aggressive styling give the Pioneer a mean look. All-round independent suspension is featured, with 200mm travel at the front and 230mm at the rear. To reduce the turning circle, which now measures 4.5m, the manufacturer has fitted longer front suspension A-arms to the latest model. Stopping force is provided by three disc brakes; 200mm discs are used on both front wheels, with one in-board mounted, 170mm disc to brake drive to the rear wheels. Unfortunately, no power assisted steering is available, which would be a good feature, especially if you are going to spend all day behind the wheel. As standard the Pioneer is fitted with a front bull-bar and skid plates underneath to prevent any major damage. Options from the factory include extra bash-guards, a winch and a 680kg rated tow bar. Front wheels feature 200mm brake discs and independent suspension with 200mm travel. 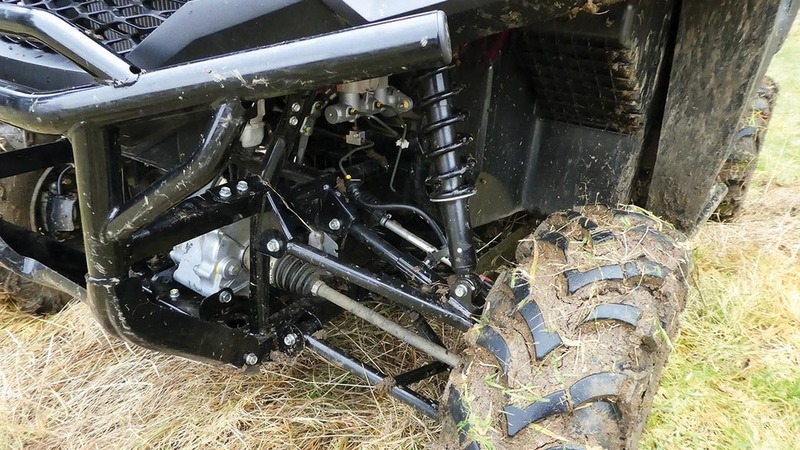 Rear independent suspension features 230mm travel and pre-load adjustable shocks. One piece bench seat and rubber floor should make for easy washing down. Inside the Pioneer’s cab it is levers galore, with mechanical controls for gearbox, four-wheel drive, and park brake, all of which are mounted on the dashboard. To keep the driver informed on their speed and fuel level, a clear digital display is mounted in front of the steering wheel. Unfortunately, in the cab there is limited storage space, with only one sealed storage compartment. As standard, the two-seater model features a roll over protection frame over the cab; the frame is extended over the tipping bed on four seater models. 386kg capacity bed features four tie-down points and is tipped via a strong gas strut. 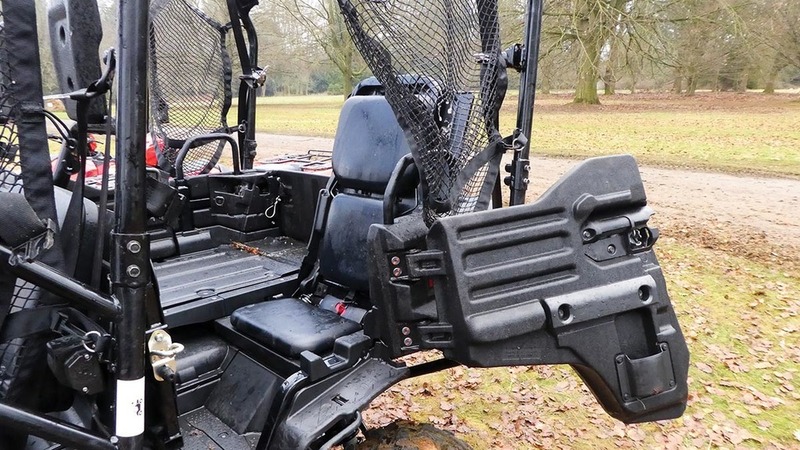 While half-height doors with safety nets are the standard way of keeping you inside the cab, a raft of windscreen, door and roof options are available as optional extras, as is a windscreen wiper and cab heater. Tipping the Pioneer’s 386kg payload bed is done through the use of a gas strut. Tailgate features an over-centred latch at either side to keep it shut – a single quick release latch would be a welcome feature. Four-seat Pioneer models feature two flip-up seats in the load bed, with hinging sides allowing access. 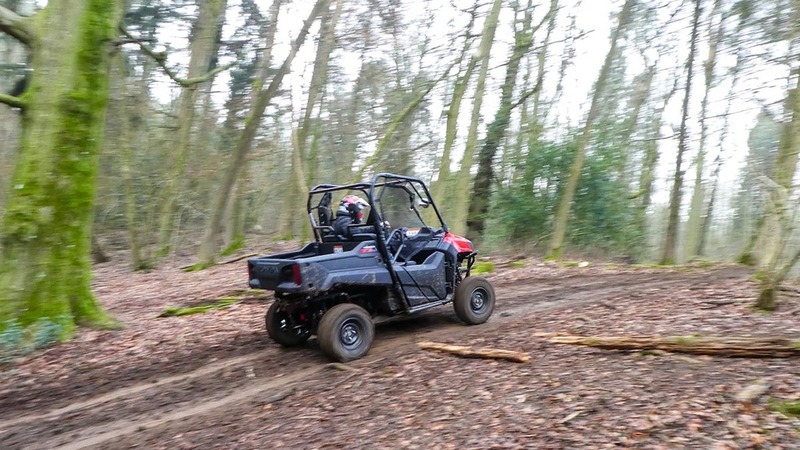 While on the cramped side, it does offer a compromise between a two-seat and a longer wheelbase conventional four-seater UTV. Roll over protection frame is extended over the load bed on four-seat models. With side opening panels to allow access to the rear seats. Or two seats can be raised, adding an extra element of versatility to the Pioneer. In our short drive the Pioneer coped well with demanding terrain, and took some hammering over rough forest ground and through trees which were perhaps a little too close together. The engine and transmission package have a good response and allow the UTV to pick up its feet in a hurry, and keep the Pioneer moving when the going gets tough. However, there does have to be a compromise between performance and the practicality of getting fuel to keep the machine running. 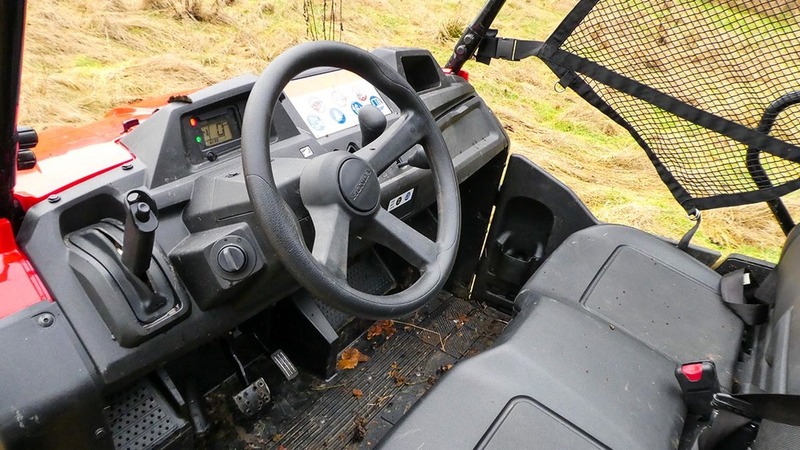 Other niggles such as; short servicing intervals, little in-cab storage, no option of power steering and a fixed rear differential, could leave the Pioneer playing catch-up with the rest of its UTV competition. Honda's Pioneer does offer an additional level of flexibility however, by accomodating four passengers in an unconventional fashion.